-Clear out a crypt, liberate the docks, and revisit some familiar locations inspired by Blood and Doom 64. -Wield the mighty sawn-off and voodoo doll, or have some with molotovs and an M60. -A combination of foes from Blood and Doom 64. -Mini-games! Battle bosses, make a last stand and get stalked by an unkillable enemy in remixed stages. -Play the bonus levels in whichever order you feel like. -Earn bonus goodies for fighting instead of speedrunning like a really boring wimp. It's been quite a few months since I wrote the previous article. Many big things have happened to Blood: Dead on Arrival since then: the mod went from v1.3 to v1.5, a stream of it was uploaded on YouTube for the first time, a review of it surfaced on YouTube as well, and just today it reached the three-thousand mark for downloads here on Mod DB. 20 more followers here on Mod DB. The v1.3 update was shared on Mod DB's Facebook page as well as other Mod DB social media. It also had an article written about it in Dark Side of Gaming. Said article has been shared and translated by many other gaming sites, like spaziogames.it. A Czech player (TartarusCast) uploaded the first stream of the mod on YouTube. And beat the campaign on the hardest possible difficulty (!!!). GeneralLotz reviewed the mod thoroughly on YouTube. His review is masterful and a must-watch for a quick overview of Blood: Dead on Arrival. An article for the mod was created on the Blood Wiki by wiki co-founder Gideon and it's currently being filled with brand-new info by yours truly. Stay tuned. MARV-ELLER showcased Blood: Dead on Arrival amongst other Blood-inspired mods for Doom in a nice video. NUKEMDAVE made an awesome wallpaper that I use. The mod is still being mirrored by gamepressure.com and GRYOnline.pl (thanks to Mod DB user MadMartiganGOL). The YouTube trailer for the mod has now reached over a thousand views and it's still the most viewed video on my YouTube channel. 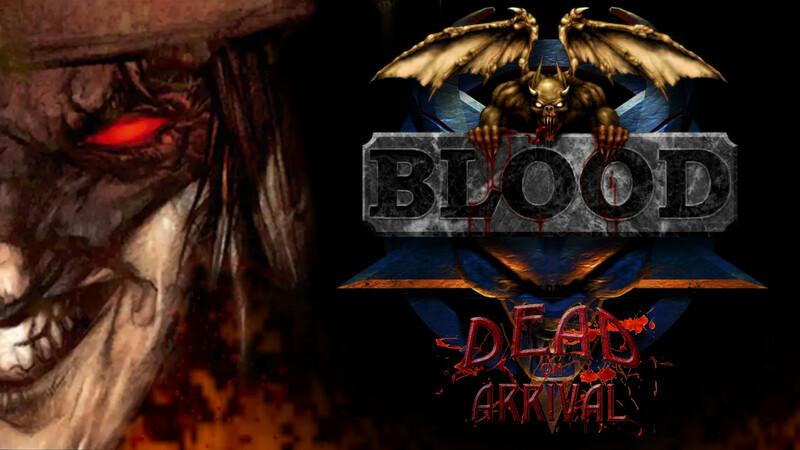 Speaking of which, I have uploaded a video on it with all of the music featured on Blood: Dead on Arrival. I prepared it in advance for this occasion, listing sources and all. A letter upgrade (v1.5b) is currently being worked on. I have created an official Discord server to talk about the mod and other projects I've worked on, so feel free to join if you want to be up to date with mod progress or if you simply want to chat. We're a cool bunch. That's all for the moment. Thanks for reading! Here's a recap of all of the achievements of the mod so far. After nine days of working on updates, we finally break the silence. Upgrade which makes Dead on Arrival standalone and adds more D64 elements. Zandronum compatible version of Blood: Dead on Arrival. 2 player cooperative/deathmatch available but unstable. Update which adds five new levels, three new enemies, two new weapons and many improvements over the previous version. Upgrade which further balances the difficulty and improves the gameplay of the mod. Update which fixes some important bugs and fine-tunes the gameplay and level design of the mod. Update which brings Blood: Dead on Arrival closer to Nirvana. Why, thank you. I think you're cool. If you haven't tried it yet, I suggest you to check the latest version (v1.4b) which came just a day after you left the above comment. It contains some very important fixes that should have been made way earlier but nevertheless, here it is. Be sure to give a vote or just a comment with your thoughts on it. Thanks for dropping by. Hope you enjoy it. v1.1 will be released soon with brand-new content! Downloading now two of my favorite games together! I hope you got to download and play it. v1.0c is out! I really hope you find it just as good to play.